It’s been over 33 years since Harvey Fierstein’s Torch Song (then called Torch Song Trilogy) was last seen on Broadway. The groundbreaking play first came to fruition at New York City’s La Mama Experimental Theatre Club in the East Village before transferring uptown for a 1,222-performance run. 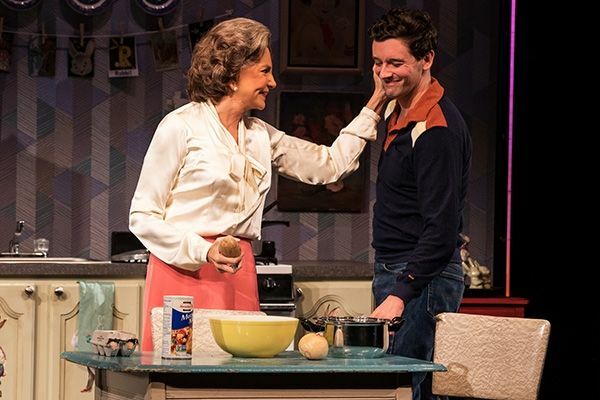 Michael Urie (Buyer and Seller, Ugly Betty) and an exceptional cast (including Tony Award winner Mercedes Ruehl) star in this stellar revival, which premiered Off-Broadway at Second Stage Theater. ShowTickets.com had a chance to catch up with Mr. Urie shortly after the play opened at The Hayes Theatre. Did playwright Harvey Fierstein offer you any insights or advice about how to approach the character of Arnold? Michael Urie: The best advice he gave us was on day one. Harvey said, “If playing this show doesn’t embarrass you, you aren’t doing it right.” I didn’t realize what he meant until my first close friends were in the audience in previews off-Broadway. In the scene with my mother, I suddenly felt humiliated. (They) were out there watching me get crushed by my own (pretend) mother, and I was helpless. I knew what Harvey meant, and I channel that every night as I imagine not only good friends watching, but anyone who has ever felt that way in an argument with their parent or loved one. We’ve seen a resurgence of gay-themed plays on Broadway over the past year, including Angels in America and The Boys in the Band. Torch Song is in great company – why do you think these themes resonate with today’s audiences? Michael Urie: Minorities are at risk now more than they were two years ago, and these plays speak to the way in which we must stand and be counted. Torch Song is about equality as much as it’s about homosexuality, and all three plays are about family. Families are being torn apart and rights are being stripped away – these plays speak to that and inspire us to hold one another tight and fight. You’re working with the great Mercedes Ruehl. What was your process like with director Moises Kaufman to build the backstory of that relationship that helps their relationship ring so true? Michael Urie: Moises is an incredible leader and this play means a lot to him; it helped him come to terms with his own sexuality. Mercedes is an animal of the stage; she loves the work and loves actors. The three of us worked very hard to make the scenes between Ma and Arnold feel spontaneous and deep. Coming back to the play after the Off-Broadway run and several months away from each other, we felt closer as a company, and our relationships were much deeper. That’s a much better way to go into rehearsal for a play about family. Have you ever had to have that kind of ultimatum conversation with someone, and why do you think those in the LGBTQ community can find it difficult to embrace their self-worth? Michael Urie: I have had to defend the self-worth of our community, luckily not with my own parents. It wasn’t fun. The LGBTQ community has been marginalized since long before its initials, and long before it became a community – this marginalization is poison to one’s self worth. To be told that you’re less than, unworthy, weak – it stings, regardless of your defiance. We can march, we can marry, we can sing out, but as long as there are those who want to strip our rights and think we don’t matter, it’s hard to believe we’re equal. New York City is lucky to have you as you balance your career in theater, film and television. What is it about the city that has you hooked, and what is your one can’t-miss recommendation for a first-time visitor? Michael Urie: I think New York City is a great equalizer, which is vital to the life force of an actor. Do I need to get away to an ocean or a mountain from time to time? Sure. But I want to be around all walks of life, class, race – not just people like me. Certainly not just people in show business. If you’re coming to New York for the first time, go see a Broadway show! And get tacos at Los Tacos across from Harry Potter and the Cursed Child. Matthew Wexler is a NYC-based lifestyle and culture writer, and editor of The Broadway Blog. Read more of his work at wexlerwrites.com.